It is RGB everywhere guys! These past few months, RGB has been infecting every component or accessory a PC can have. Today we are going to check out and review the Corsair MM800 RGB Polaris Gaming Mouse Pad. Just how much light do you need on your desktop? Not to mention, how many colors do you want to see on your desktop? If the answer is all must have (RGB) lighting, then don’t stop on the mouse and keyboard; because with the MM800 RGB Polaris, it’s going to add RGB illumination around your mouse. Interested in adding more lights or illumination on your desktop (table)? Please continue reading our Corsair MM800 RGB Polaris gaming mouse pad review below. 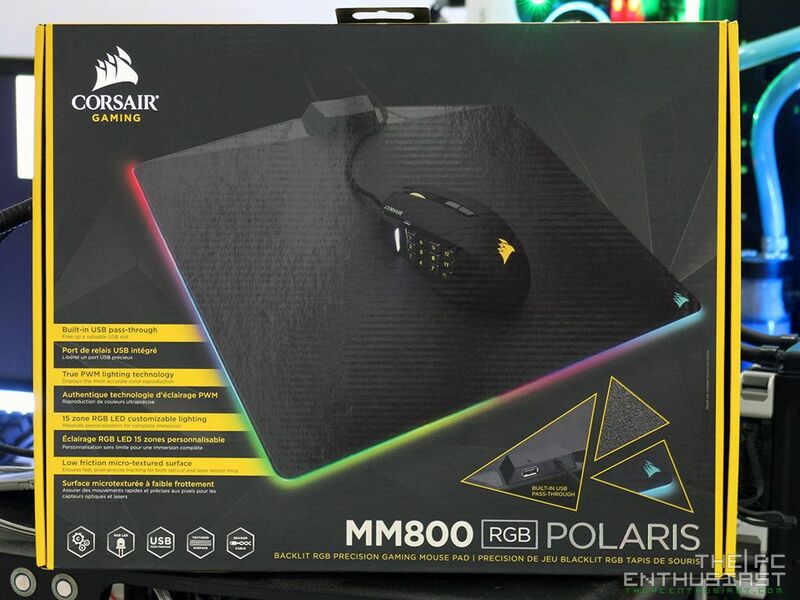 The Corsair MM800 RGB Polaris is a hard surfaced type gaming mouse pad with RGB illumination on its three sides (left, right and front). It features 15 individual edge-mounted RGB zones powered by true PWM lighting technology to display the most accurate color reproduction. 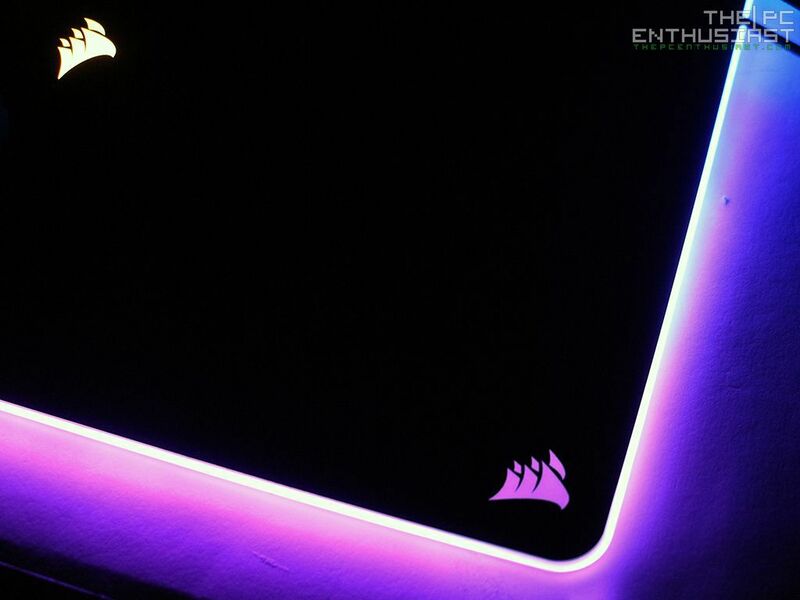 The lighting effect on the MM800 RGB Polaris can be controlled and configured via Corsair’s Utility Engine; and can be synchronized with other Corsair RGB products like the Scimitar PRO RGB gaming mouse. 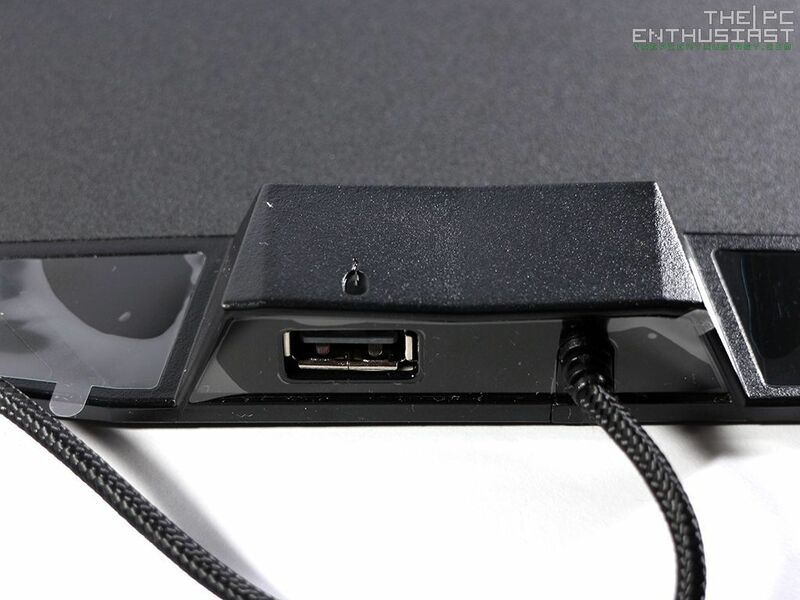 It also features an integrated USB pass-through port so that you don’t need to connect you mouse all the way to the back of your PC. Too bad the pass-through port is only USB 2.0 (and not USB 3.0); although if you are planning to connect just a mouse, the USB 2.0 would be enough. 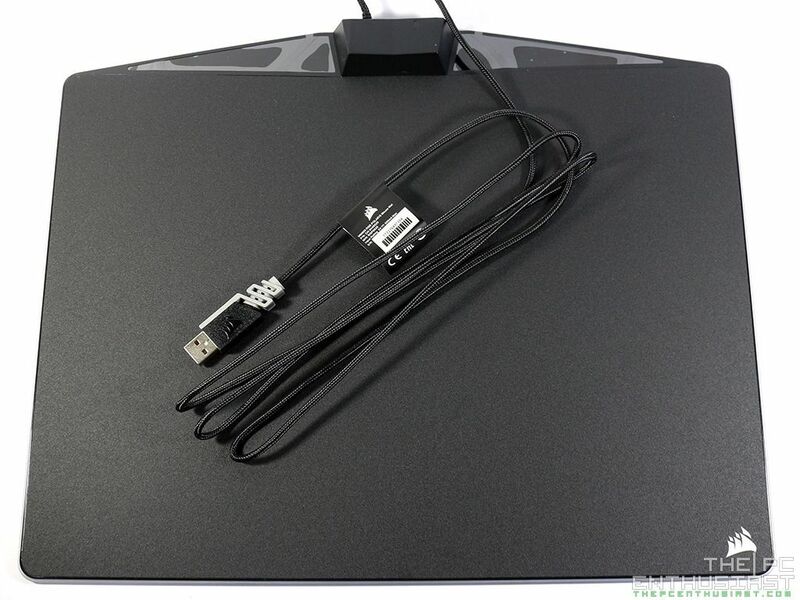 I’ll discuss more of its features or specs as we take a closer look on the mouse pad itself below. Corsair’s packaging is pretty standard and consistent with the black and yellow theme. As expected, the box is sturdy and the highlighted features of the product can be read on the surface of the box. 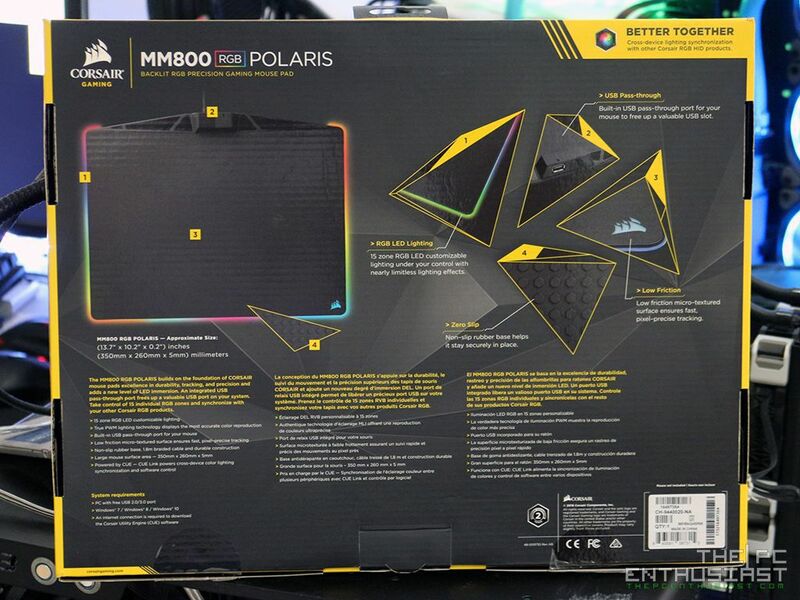 Inside the box, you get the MM800 RGB Polaris gaming mouse pad and some reading materials. 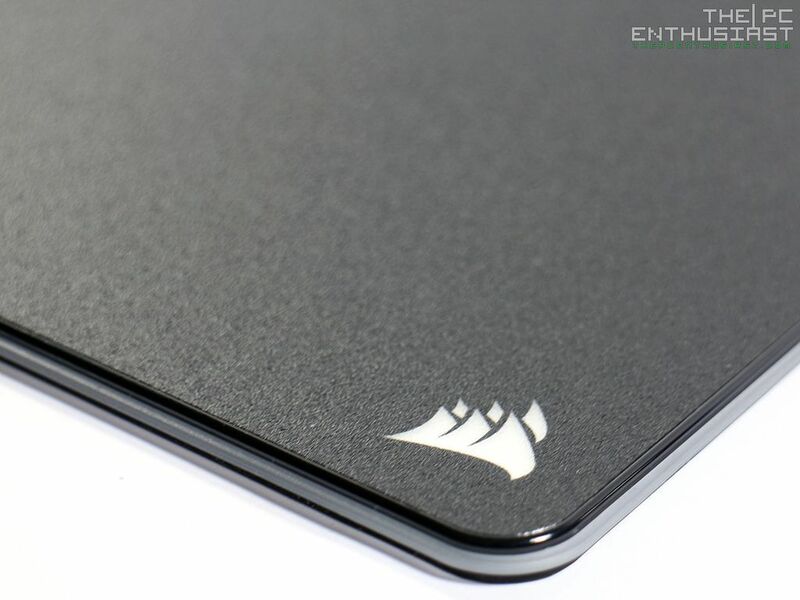 Behold, the Corsair MM800 RGB Polaris gaming mouse pad, it looks so clean and neat. It has a 1.8m braided cable with Corsair’s standard USB plug. The pad itself measures around 350mm in length, 260mm in width and 5mm in thickness. It also weighs around 560 grams. The MM800 RGB Polaris features what the company calls a low friction micro-textured surface. This ensures a fast, pixel-precise tracking and is calibrated for both optical and laser sensor mice. If you try to feel the surface with your fingers, it feels a little bit coarse or textured. 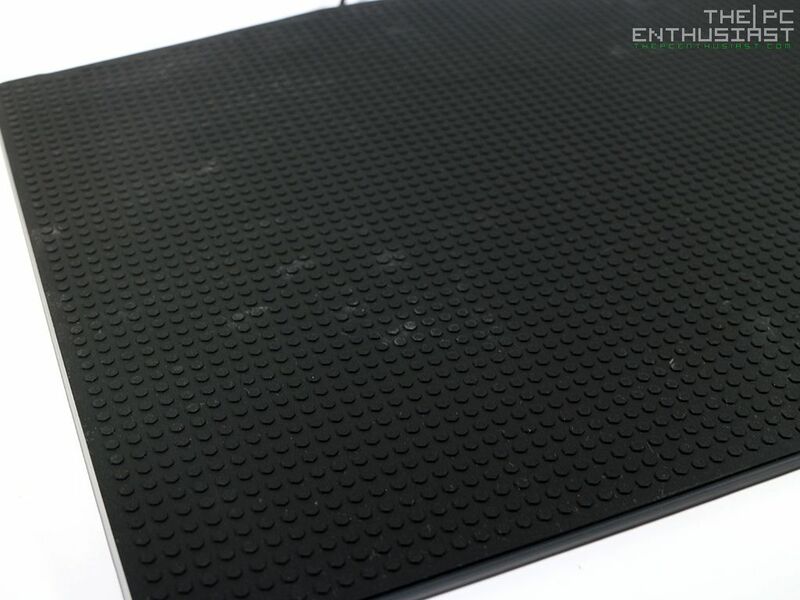 It’s not smooth, like a surface of a gaming mouse, or even a surface of aluminum brushed metal. On the top center are where the USB cable is located and a USB 2.0 pass-through port. You’ll need this to (conveniently) connect your mouse; although, if you decide to connect your mouse on this port, you’ll have to roll and tie up the mouse’s cable. I personally would prefer to match this mouse pad with a wireless mouse. Flipping the MM800 reveals a rubber base; the entire base has rubber grip and not just a portion. The grip on this mouse pad is great and it even attaches to glass surface without any problem. Like the Scimitar Pro RGB gaming mouse, you’ll also need the Corsair Utility Engine to customize and synchronize the LED lighting effect on the MM800 RGB Polaris. 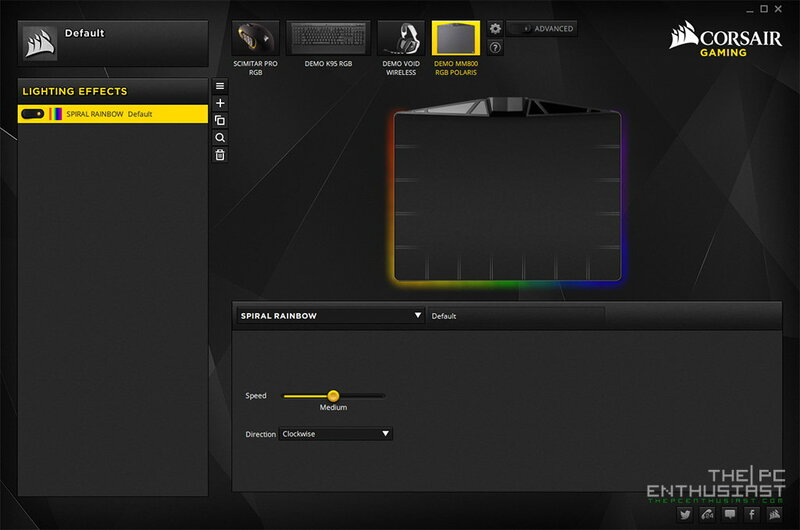 You can download this utility from Corsair’s website. There’s only one menu setting for the MM800 and setting it up is very easy. No complicated stuff here. There are plenty of lighting effects to choose from (not shown above), including the lightning link that will synchronize and affect other connected and compatible device. The Corsair MM800 RGB Polaris was fun to use; the textured hard surface was able to provide my Scimitar Pro RGB with a precise and accurate tracking. 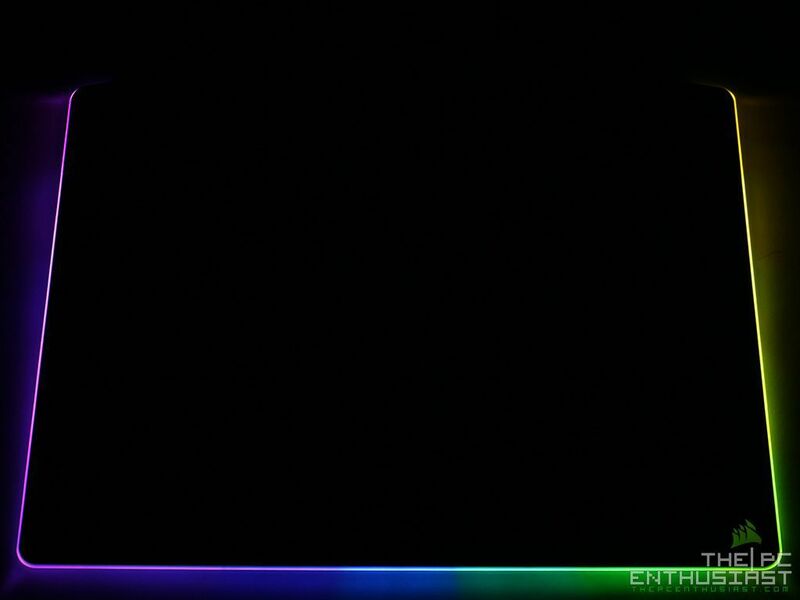 Lighting effects were dazzling as well and you have the freedom to choose from the several effects depending on your preference. Note that in actual, the colors don’t bleed out that much, or not super bright as shown on the (big) photo above. It looks more like the photo on the left hand side. I took those photos without any additional lights to emphasize the colors. While, I don’t have any problems with the MM800 itself (since it’s really good both form and function), I find it a little bit hard to clean the surface due to the micro-texture surface. Tiny dusts, dirt, stain or something that could sink in between those textures would be hard to remove. Wiping it off with a tissue or cloth doesn’t seem to remove those easily. You may need to (gently) use a brush to remove those tiny dirt or stains. The Corsair MM800 RGB Polaris gaming mouse pad has been in the market for quite some time now, and it’s available in the US and UK. It comes with a manufacturer’s suggested retail price of $59.99 and comes with a two year warranty from Corsair. Prices do change from time to time, so better check out their latest pricing and availability via the links below. 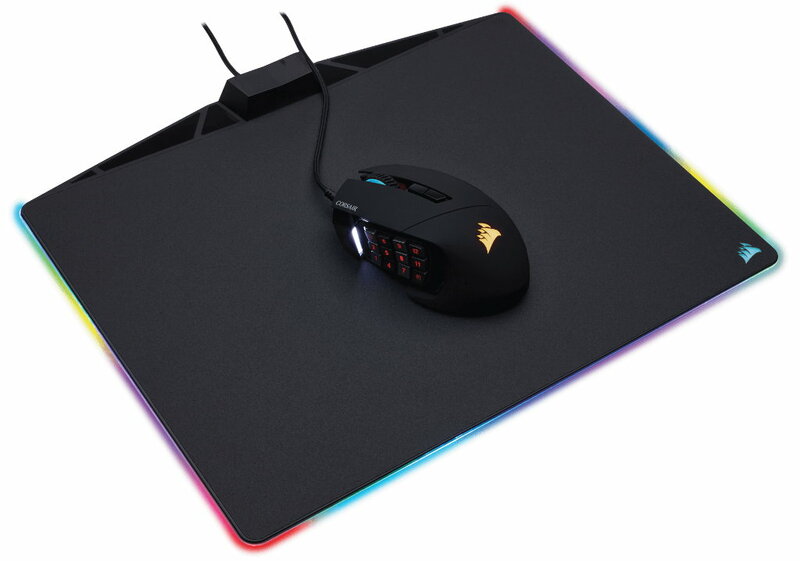 An RGB mouse pad may sound overkill already, and quite frankly some are not into the RGB craze. To be honest, the real function of the (RGB) lighting effect on this mouse pad is purely for aesthetics only, an eye candy. It won’t make your scores high or ranking better. But it does the job well at pleasing my eyes! The textured-surface area does help on the accuracy of the mouse, but there are some people who do not prefer a hard-surfaced mouse pad. So if you are one of them, the MM800 RGB Polaris may not be for you. The MM800 RGB Polaris is a great and high-quality product, but it doesn’t come without any disadvantage or something that you need to consider. First is that it may be a little bit difficult to clean the textured surface compared to a regular smooth surface. 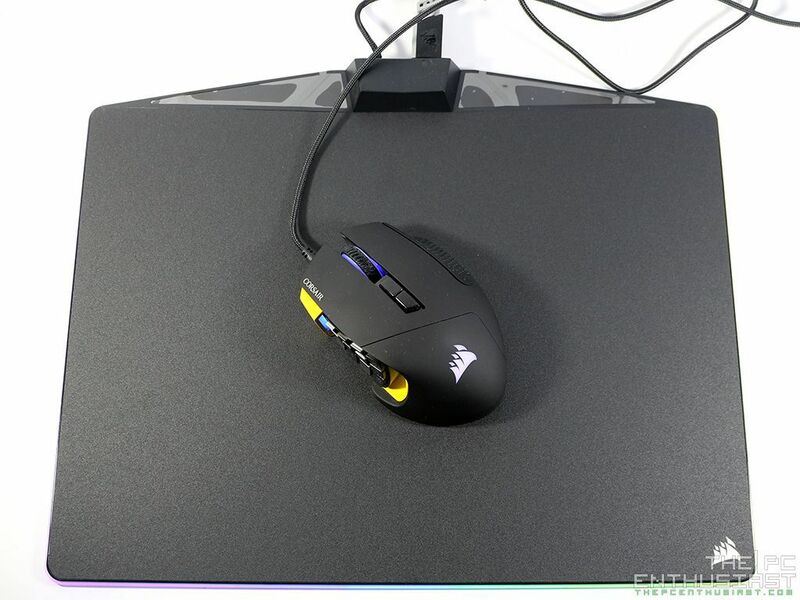 Second, the MM800 is quite a large mouse pad and definitely there is no way you can fold or bend it. You’ll need an ample space on your desk or table for the mouse pad alone. With those being said, I don’t find any major faults on the MM800 RGB Polaris. The build quality is great, as expected from a Corsair product; the rubber base does the job well at keeping the mouse pad in place; and the RGB lighting looks great in person (better than I expected). A good mouse pad is definitely necessary for your optical / laser based mouse. 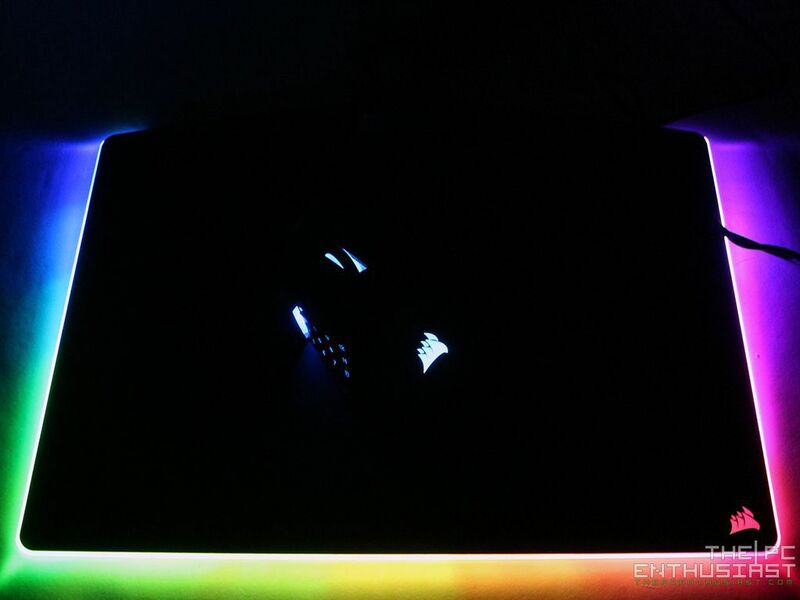 But products like this MM800 RGB Polaris, or its competition, are already more of a preference or personal choice. However, if you need more RGB in your desktop, this is one product that you should definitely have for your (gaming) mouse. Patriot Viper V560 Laser Gaming Mouse Review – A Bang For Buck Gaming Mouse?